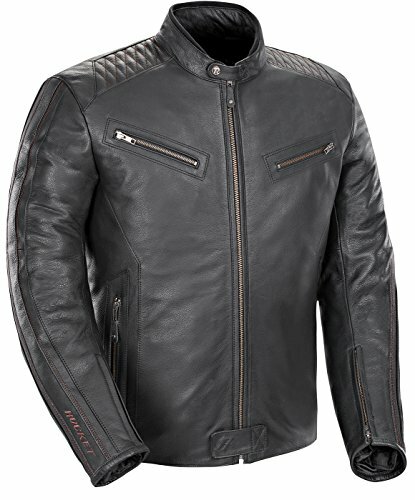 The best motorcycle jacket is the one that gives you the protection you need whilst still looking fashionable enough that you don’t dread taking it out of the closet. 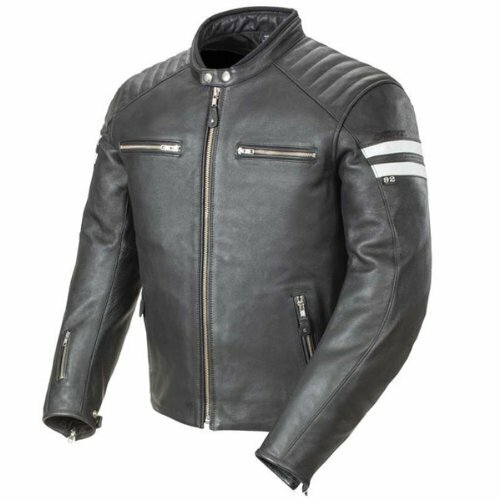 Leather motorcycle jackets are always going to offer you far more protection than textiles due to the abrasion resistant qualities of leather. Even some of the best textile motorcycle jackets that incorporate Cordura, a synthetic material similar to nylon, aren’t going to withstand the same level of abuse. And when you’re sliding along the tarmac at 80 mph and covering a distance that seems as if it will never end, those extra seconds are going to mean all the difference between making your way back home without a scratch and spending weeks in hospital trying to find some suitable skin for a skin graft. Textile jackets are great for flowing a ton of air and keeping you cool and dry so we’re still going to include a few in our review. You’ll just need to moderate how extreme you get when out on the road. 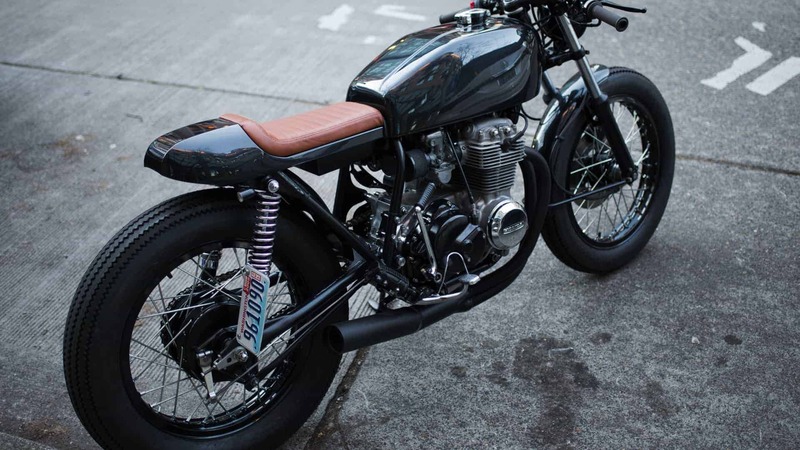 Available in black or a vintage brown leather, the Classic ’92 is perfect for cruisers and sportsbikes alike. We especially like the casual look as bright race replica colours aren’t always great for blending in and look out of place once you’re off the bike. On the other hand, you could easily wear the ’92 as a jacket even when you’ve left your bike at home. Sadly, no armour is present so you’re going to need to buy a CE certified set of elbow and shoulder pads as well as the prerequisite back protector. What you do get is a zip in, zip out liner which is going to make this jacket 3 /4 seasons depending on where you live. The leather here is standard pull up cowhide, roughly 1.2mm thick which is more than enough for scraping yourself along the road. Sizing runs a little large so you may find yourself sizing down one full size. Similar to the Classic ’92, the Vintage Rocket offers even more of a casual twist but gets rid of those white stripes for a blacked out look. The look and feel of this thing as well as the attention to detail is staggering, especially when you take into account the price point. Plenty of pockets are available, both inside and out, all fitted with sturdy YKK zippers. Again, armour is sold separately as with most Joe Rocket jackets but it is available fairly cheaply so shouldn’t pose an issue. You’ll be pleased to know you’re still get a removable liner which provides some much needed warmth in the colder months and the outer shell is again 1.2mm cowhide. Although a classic American fit, sizing runs pretty much true so make sure you consult the size chart. 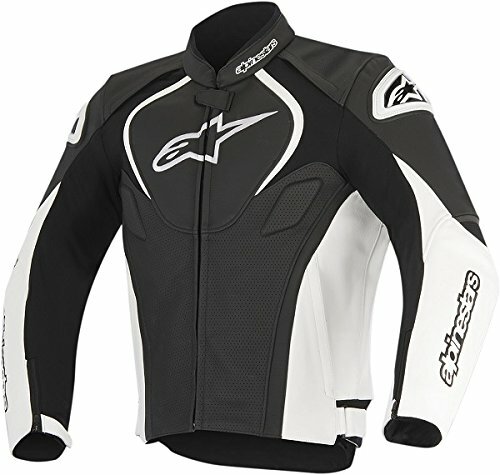 For all you part time MotoGP riders, Alpinestars has just the jacket for you. Available in a range of garish colours, aspiring Rossi’ and Marquez’ will feel right at home. With this sort of jacket, you’re getting something much more technical and race inspired than your average casual leather jacket. The fit itself is completely different and is designed to complement you when you’re in a race tuck. That said, the stretch panelling present under the arms means you’re able to move them with ease so this jacket should be suitable for all types of bike. Leather present is 1.4mm thick, offering you some of the best abrasion protection available. CE certified shoulder and elbow armour come fitted as standard, leaving you to purchase the back protector of your choice. You’re also getting built in padding to the chest and back for added comfort and protection. A removeable thermal liner and loads of perforation tops off the great feature set of this jacket. The perforation is going to give you the air flow and cooling capability of textiles but with all the protection of leather. You might find yourself sizing up in this one due to the more fitted design. 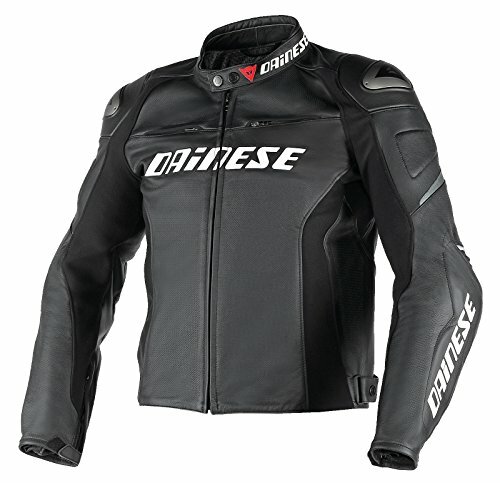 Everyone has heard of Dainese, or at least seen their trademark logo when out and about. Considered to be the pinnacle of motorcycle safety gear, Dainese have used their racing pedigree to bring us the Racing D1. Relatively casual in appearance but sporting a technical race fit, the D1 is perfect for street or track. With the D1, the jacket itself is CE certified to level 2, not just the armour as you’ll find with most jackets. All of the stitching used to craft this jacket has been reinforced across all panels, leaving you safe in the knowledge that you’ll be protected should the worst happen. The fit is slim and athletic so you muscular types will need to size up to get your arms and shoulders sitting comfortably. This jacket is a step above the Alpinestars Jaws so is perfect for all of you aspiring speed demons. 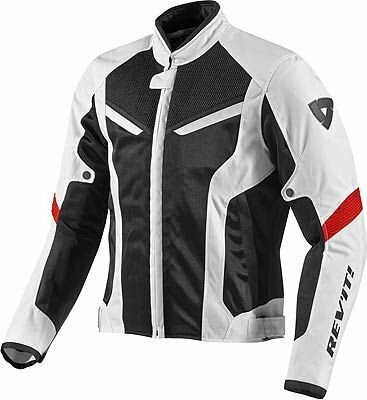 Rev’It have been a staple on the motorcycle gear scene for years and provide a cost conscious range of options that still perform. 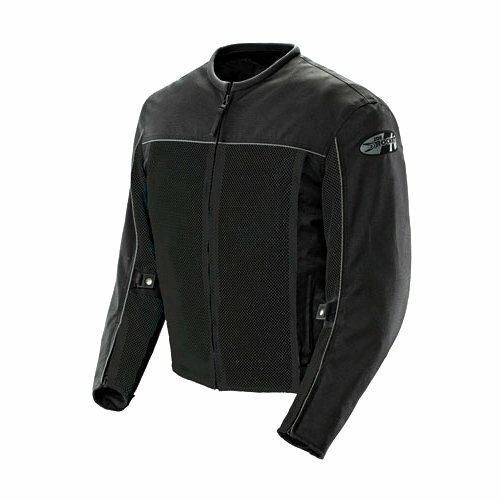 The GT-R Air is your standard low profile textile jacket incorporating a small amount of mesh. Tons of airflow but as stated, won’t offer as much crash protection as leather. The outer shell is high density 600D polyester so is still far better than denim or other textile materials. Shoulders and elbow protection is present but you’re on your own with the back protector which is only available separately. This jacket does fit very well and could be described as a tailored slim fit. People love it and it is one of Rev’It best sellers as a relatively low cost but functional jacket. Your other comparable textile option is the Velocity from Joe Rocket. This jacket incorporates far more mesh so is going to offer even less protection than the GT-R.
What you do get is contoured armour in the arms and shoulders as well as a removable waterproof liner. Plenty of flexibility is provided due to the mesh construction and the jacket is very comfortable. Protection or comfort, it’s your call. Here at Motorcycle Secure, we all ride in leather. Keeping cool is secondary to keeping hold of your original skin so we prefer to cook in the Sun every time. This can be reduced though with a perforated leather jacket which we find to be the best of both worlds. The choice is yours! And if you’re still not convinced, riding in suitable gear instead of a t shirt or vest provides you with plenty of extra storage space for the safe keeping of essentials such as your motorcycle helmet lock and the other important items you regularly ride with.